The frigid weather in Yellowstone cleared by mid-morning and by mid afternoon the temp hit a balmy 24 degrees. No more pain when taking off gloves to adjust something on the camera. I did a two hour snowshoe trek to take photos of a tree-rock grouping, but when all was said and done I’m not liking the results on my laptop. I’ll hold off final judgment until I get home to a normal desktop screen. On the way out of the park towards dusk, my colleague spotted a bighorn sheep ram on the side of a cliff and we pulled over to photograph. This guy was a gorgeous specimen, shown here eating some dried grasses (captured with a Nikon D800, 200-400mm Nikkor lens, Gitzo 3541 and RRS BH-55 ballhead, ISO 1600, f5.6, 1⁄800 sec). 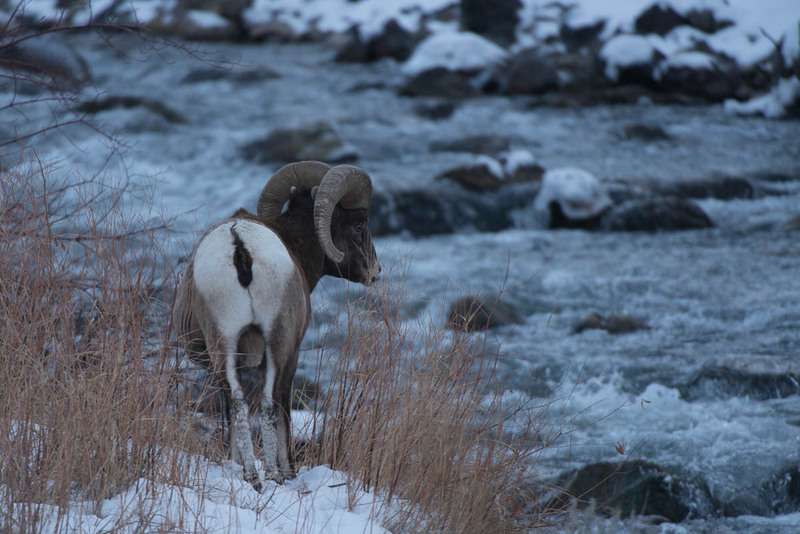 I watched as he foraged his way down the cliffside, all the while looking up to the other side of a creek, where a female stood right at the top of the ridge line. Finally, he came down to the road, ran across and down the embankment to the stream. He walked back and forth, as if deciding whether or not to cross. Truth be told, he did turn around and run back up the cliff where we first spotted him. His libido was just no match for the frigid river.